From now on, it would be nice if everyone would mention about new media hits in this thread. That would make updating the Press section a lot easier. So please post all newspaper scans, vidcaps, radio interviews etc. either to this thread, or send them to contact@eurobilltracker.com. The Press section should be now up-to-date, let's try to keep it that way. The French TV channel France 5 will broadcast something about EBT tomorrow morning, in Les Maternelles, which is normally a program about babies and young parents. It'd be great if someone could capture the video for the rest of us, not everyone can watch that channel.. It just started , as to see in the list.. in 15 minutes over 70 new french users.. I just noticed that we have only 2000 users from France, from Spain and from Italy. Those are alarmingly low figures! I hope many houndrets will join today and maybe few of them will get a hit. That would encourage the rest. I was on vacation when there was an article in a Finnish newspaper. 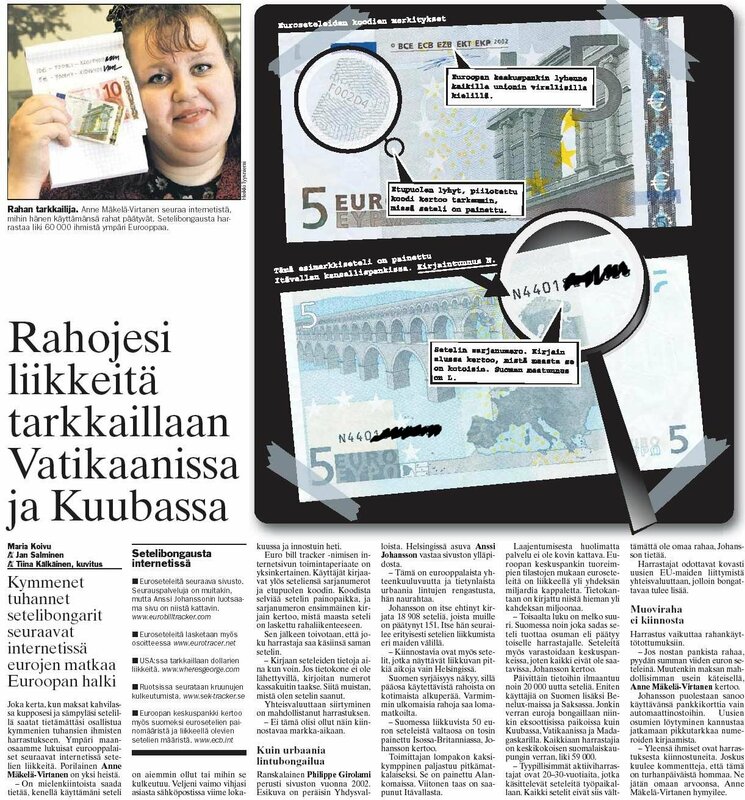 Aamulehti, the newspaper of the Tampere region wrote: Picture text: A money observer. Anne Mäkelä-Virtanen follows in the internet where the money she spends end up to. Almost 60000 people around Europe have notespotting as their hobby. Headline: The moves of your money are being watched in Vatican and Cuba. Ingres: Tens of thousands of notespotters follow the notes' travelling through Europe in the internet. Each time you pay your bum and cup of coffee in a café with a note, you may unknowingly take part to a hobby of tens of thousands of people. All around our continent several Europeans follow the movings of their notes in the internet. Anne Mäkelä-Virtanen from Pori is one of them. - It's interesting finding out who's had the note I used before me or where it'll find its way after me. My brother's wife gave me a hint about this site in email last November and I was interested right away. The principle of the netsite called Euro bill tracker is simple. THe users write down their notes' serial numbers and the code from the front side. The code tells the printing place and the first letter of the serial number tells in which country the note was put in circulation. After that it's just hoped that someone of the hobbyists gets the same note in his hands. - I write down the notes' infos whenever I can. If the computer's not nearby, I write the numbers behind a shopping bill. That way I remember where I got the note from. Joining the common currency has made the hobby possible. - This wouldn't have been this interesting during the mark time. French Philippe Girolami founded the site in year 2002. The idea is from USA. Anssi Johansson, who lives in Helsinki, is responsible of maintaining the site. - This is European togetherness-feeling and kind of urban bird-ringing, he says laughing. Johansson himself has had time to enter 18 908 notes, of which others have found 151. He himself follows especially the way the notes travel between different countries. - Also notes that seem to spend very long times only in Helsinki are quite interesting. Finland being far away from everything is quite clearly visible, because most of the money used is of domestic origin. The surest way of getting foreign notes is by travelling. - However, most of the 50e notes circulating in Finland are printed in Great Britain, Johansson tells. The twentier in the reporter's wallet is found out to be a long-distance traveller. It's been printed in the Netherlands. And the fiver has come from Austria. Even though the service has expanded, it doesn't cover very much. According to the newest statistics from the European Central Bank there are over 9 billion euronotes circulating. Slightly over eight million of them have been entered in the database. - In the other hand the number is pretty high. In Finland about every 100th note produces a hit, meaning that some other hobbyist finds it. Notes are also being stored in the central banks, so all of them aren't available, Johansson tells. Each day about 20 000 new notes are added in the files. Most users after Finland can be found from the Benelux countries and Germany. On a very small scale the euros are spotted in places even as exotic as Cuba, Vatican and Madagascar. Altogether there are as many hobbyists as there are inhabitants in a middle-sized Finnish city, almost 59 000. - The most typical active hobbyists are 20-30-year-olds, who handle notes at their working place. So, not all of the money are the users' own, Johansson knows. The hobbyist are waiting very much for the new EU-countries joining to the common currency, when there will be more notes to spot. The hobby affects the money using habits. - If I withdraw money from a bank, I ask to get the amount in five euro notes. And also in other situations I pay in cash as often as possible, Anne Mäkelä-Virtanen tells. And Johansson says he uses the bank card only for ATM-withdrawals. Finding new hits encourages to keep on carefully entering the numbers. - Most often people are quite interested in the hobby. Sometimes I hear comments that this is useless waste of time. I don't care about those, Anne Mäkelä-Virtanen smiles. Headline: Notespotting in the internet. * A netsite following the euronotes. There are also other sites dedicated to notetracking, but the one whose captain is Anssi Johansson is the best of them. I have already sent it to Avij, so I guess it´s going to be in press-section in a while..
Nice, could someone please translate it? Thanks! Getting a note from changemoney or bankautomat may tell you more than you would believe in first sight. 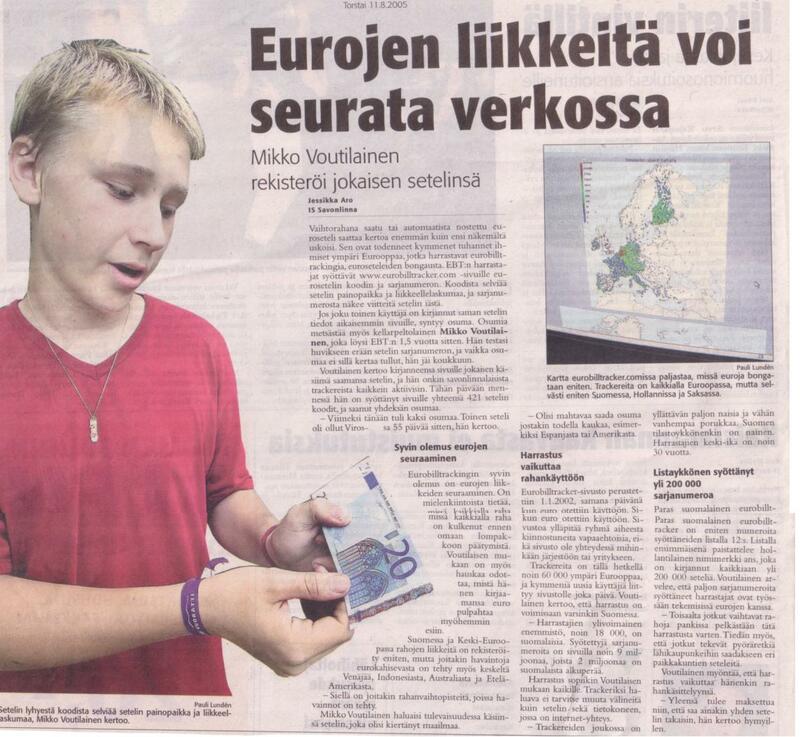 It has been noticed by tens of thousands people around the Europe, who´s hobby is eurobilltracking, finding euronotes. EBT's trackers enter the code and serial of the note. The code tells you the printingplace and the country of the note, and from serial you get clue about the age of the note. If somebody has entered the same noteinfo earlier to the system, it´s a hit. Hit's are hunted also by Mikko Voutilainen, from Kellarpelto, who discovered EBT about 1,5 years ago. He tested one serial, and even there wasn't a hit, he got hooked. Voutilainen tells that he has entered every notes that he gets, and he is the most active user from Savonlinna. In his time in EBT, he has entered 421 codes, and got 9 hits. -Today I had two hits. The other note has been in Estonia for 55 days ago, he tells. The deepest thing in following euronotes is to track where your note is going or where it has been. It's interesting to know where your note has been before it has come to you. According to Voutilainen, it's also fun to wait where his note pops later up. The most of the notes is entered in Finland and in the Middle-Europe, but theres some registerations from euronotes in the middle of Russia, Indonesia, Australia and South-America. -There's some moneychange-places where those enterings come. There was an article in a French weekly called "L'Express" and I was interviewed on a major radio network this morning in France, during the morning show. We're seeing a surge of French users, let's see how long it lasts !